Insulation is one of the easiest ways to reduce energy consumption and greenhouse gas emissions, increase manufacturing productivity, control condensation and mold growth, and plenty of other benefits. But the only way to reap these benefits is by properly maintaining your insulation systems. It is estimated that between 10% and 30% of all exposed mechanical insulation becomes missing or damaged within 1-3 years of installation. That means that all of the savings projections will significantly decrease—unless a maintenance plan is implemented. Mechanical insulation is generally very low-maintenance, but it requires regular visual inspections and routine upkeep to function the way it was intended. Start by educating decision-makers about the benefits of mechanical insulation systems and the risks of not actively maintaining them. Many decision-makers don’t have detailed knowledge about why insulation is important, so getting buy-in from the top down is important. Use financial models and cost savings projections to influence decision-makers into allocating the attention and resources you need to implement your insulation maintenance initiatives. Insulation maintenance is an investment, not an expense. The damage and loss of cost savings that can be caused by a lack of maintenance can be significant. Some companies have someone in charge of recycling efforts or other green initiatives. Well, every plant, facility, or company needs an insulation “champion,” too. This person needs to own the responsibility for making sure the maintenance gets done effectively and on time. That way there is accountability and this process starts to become ingrained. Make sure that best practices are being used across all departments/branches. Take into consideration any pressure from competing—and sometimes more “glamorous”—initiatives. Use your insulation champions to keep the ROI and cost savings top of mind. It can be difficult to implement a mechanical insulation maintenance plan when there are so many other initiatives going on. 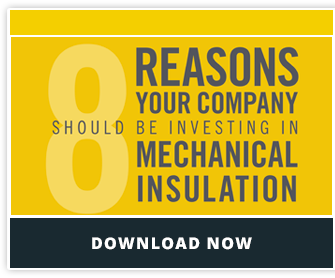 But by providing a bit of education about the benefits of insulation, you can create champions who will help you impact the company’s operations and bottom line.